Main Features Completely sealed aluminum casing with a new modern design cover. New high efficiency fan ventilation system (HPV) allowing easy matching with boilers having high combustion chamber back pressure. Compact burner dimension with low noise levels. New air damper with progressive micrometric air regulation adjustable in 3 positions. Air damper with 60 or 80 mm snorkel adaptor (optional). New electrical wiring simple to disassemble for easy maintenance. Combustion head easy to assemble and adjust for fine set up. Single bolt burner fixing and the possibility to firmly secure it to the flange in three different positions for easier maintenance. Ease of installation with adjustable flange (optional only for TL from Max 1 to Max 12). Monoblock electrodes for easy and steady installation into the nozzle even after maintenance. 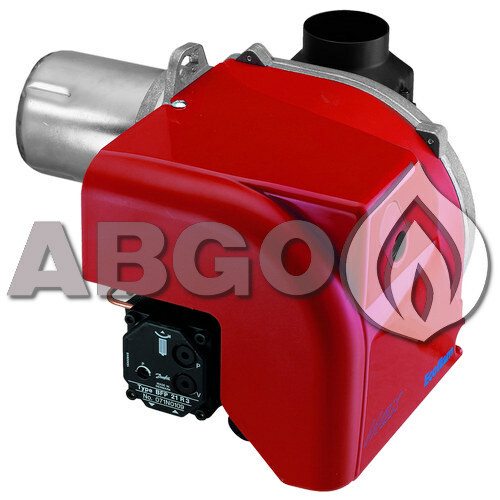 Hi - Low version available with compact hydraulic system (Max AB HS). Low NOx version with yellow flame developed by Ecoflam. Max range available with "D" pump for light oil with viscosity up to 200 cTs.